Marginal zone lymphomas are indolent lymphomas that arise from memory B cells in the marginal zone of lymphoid tissue. They include splenic marginal zone lymphoma, nodal marginal zone lymphoma, and extranodal marginal zone lymphoma. Extranodal marginal zone lymphomas occur outside lymph nodes (eg, in the gastrointestinal tract, thyroid, orbit, leptomeninges, spinal cord, or skin). [2, 3] MALT (mucosa-associated lymphoid tissue) lymphoma (MALToma) is the term traditionally used for extranodal marginal zone lymphoma of MALT. 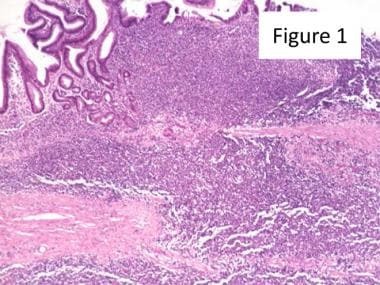 This review focuses on gastric marginal zone lymphoma. The true incidence of gastric MALT lymphoma worldwide remains unclear because presenting symptoms are nonspecific and endoscopy findings often mimic gastritis. Nonetheless, H pylori prevalence can be loosely applied as a surrogate for gastric MALT lymphoma worldwide prevalence, bearing in mind that most people infected with H pylori do not become ill from the bacteria. H pylori infection continues to decline worldwide, [15, 17] causing a marked decrease in the incidence of associated diseases, including gastric MALT lymphoma. The clinical presentation of lymphomas depends largely on its location and is similar to those of other malignancies affecting that specific organ. Unfortunately, the most common presenting symptoms of gastric marginal zone lymphoma are nonspecific upper gastrointestinal complaints such as dyspepsia, abdominal pain, and/or hemorrhage. Once the diagnosis of gastric marginal zone lymphoma is established, possible etiologies such as H pylori gastritis and autoimmune diseases should be excluded. 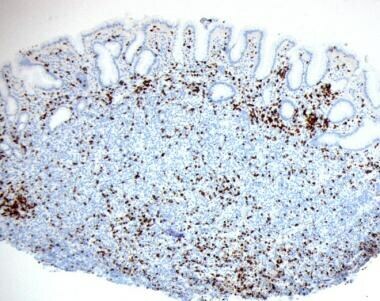 If the presence of active H pylori infection is not proved by histochemistry, serology can increase the diagnostic yield. The presence of autoimmune diseases should not be excluded to the organ involved by MALT lymphoma. In summary, clinical symptoms and signs, as well as endoscopic images, are often not specific. The diagnosis relies on endoscopic biopsies with a firm pathological subtyping of the lymphoma. Locoregional staging requires endosonography. The multifocal localization and dissemination pattern in marginal zone lymphomas of MALT-type requires multiorgan staging programs. Florid reactive lymphoid follicles have three compartments: marginal zone, mantle zone, and follicle center. Reactive B cells of the marginal zone have medium-sized nuclei that resemble the nuclei of small cleaved follicular center cells (centrocytes). In marginal zone lymphoma, centrocytelike tumor cells that often show monocytoid or plasmacytoid differentiation selectively invade gut epithelium, forming characteristic lymphoepithelial lesions. Later, they invade follicles, sometimes giving a follicular pattern. See the images below. This image depicts typical lymphocytic infiltrate in marginal zone B-cell lymphoma. B-cell centrocyte-like cells are shown in this image. 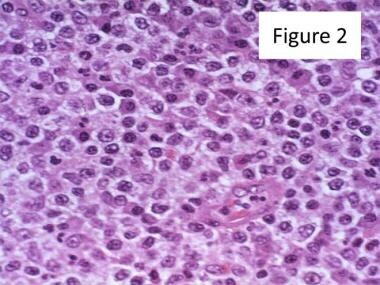 Lymphoepithelial lesions (LELs) can be seen in this image. As marginal zone lymphomas arise from B cells, B-cell markers (eg, CD20, CD79a, CD10, CD23, and bcl-2) are expressed. 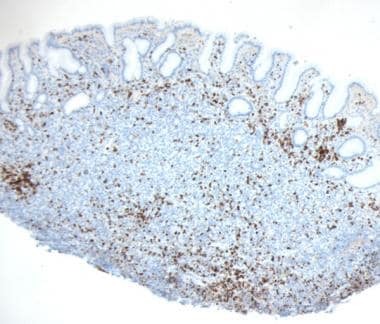 Frequently, a coexpression of T-cell marker CD43 suggests a neoplastic proliferation. In some cases, light-chain restriction can be demonstrated with kappa and lambda light-chain antibodies. 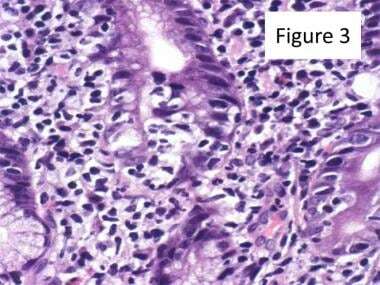 In neoplastic proliferations, there is an excess of kappa-positive, exceeding 10:1 of lambda-positive, cells. This image depicts marginal zone lymphoma cells expressing CD20. This image depicts marginal zone lymphoma cells expressing CD3. This image depicts marginal zone lymphoma cells expressing CD5. 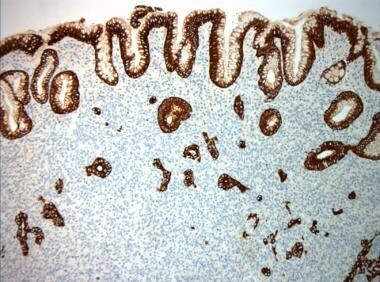 Epithelial destruction is highlighted in this image with the use of broad-spectrum keratin AE1/AE3 reagent. Translocation t(11;18)(q21;q21) API2-MALT1 is found in around 30% of MALT lymphomas. Two other known genetic alterations include translocation t(14;18)(q32;q21)/IGH-MALT1 found in roughly 10% of MALT lymphomas and t(1;14)(p22;q32)/BCL10-IGH. Lymphomas harboring these translocations commonly activate the nuclear factor (NF)-kappaB pathway and usually do not respond to H pylori eradication. In contrast, most of gastric lymphomas without such translocation can be cured by antibiotics. Early low-grade gastric MALT rarely transforms into secondary diffuse large B-cell lymphoma or progresses beyond the stomach. 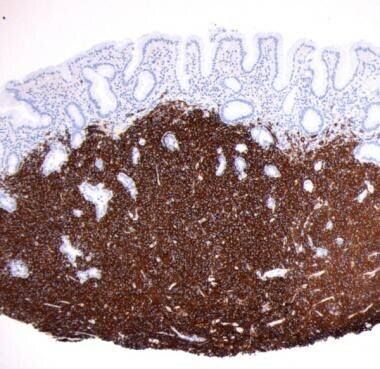 Gastric MALT lymphoma often remains localized without progression for prolonged periods, even without treatment. In general, H pylori eradication is the primary treatment for patients with stage I and II disease with low tumor load. If H pylori bacteria cannot be identified in tissue sections, active infection must be ruled out by other means such as urea breath test or stool antigen test. H pylori eradication therapy with antibiotics can cure about 70% of gastric MALT lymphoma. Zucca E, Bertoni F, Stathis A, Cavalli F. Marginal zone lymphomas. Hematol Oncol Clin North Am. 2008 Oct. 22(5):883-901, viii. [Medline]. Baecklund E, Smedby KE, Sutton LA, Askling J, Rosenquist R. Lymphoma development in patients with autoimmune and inflammatory disorders--what are the driving forces?. Semin Cancer Biol. 2014 Feb. 24:61-70. [Medline]. Khalil MO, Morton LM, Devesa SS, Check DP, Curtis RE, Weisenburger DD, et al. Incidence of marginal zone lymphoma in the United States, 2001-2009 with a focus on primary anatomic site. Br J Haematol. 2014 Apr. 165(1):67-77. [Medline]. Harris NL, Jaffe ES, Stein H, Banks PM, Chan JK, Cleary ML, et al. A revised European-American classification of lymphoid neoplasms: a proposal from the International Lymphoma Study Group. Blood. 1994 Sep 1. 84(5):1361-92. [Medline]. Bertoni F, Coiffier B, Salles G, Stathis A, Traverse-Glehen A, Thieblemont C, et al. MALT lymphomas: pathogenesis can drive treatment. Oncology (Williston Park). 2011 Nov 15. 25(12):1134-42, 1147. [Medline]. Zucca E, Conconi A, Pedrinis E, Cortelazzo S, Motta T, Gospodarowicz MK, et al. Nongastric marginal zone B-cell lymphoma of mucosa-associated lymphoid tissue. Blood. 2003 Apr 1. 101(7):2489-95. [Medline]. A clinical evaluation of the International Lymphoma Study Group classification of non-Hodgkin's lymphoma. The Non-Hodgkin's Lymphoma Classification Project. Blood. 1997 Jun 1. 89(11):3909-18. [Medline]. Parsonnet J, Hansen S, Rodriguez L, Gelb AB, Warnke RA, Jellum E, et al. Helicobacter pylori infection and gastric lymphoma. N Engl J Med. 1994 May 5. 330(18):1267-71. [Medline]. Fischbach W, Goebeler-Kolve ME, Dragosics B, Greiner A, Stolte M. Long term outcome of patients with gastric marginal zone B cell lymphoma of mucosa associated lymphoid tissue (MALT) following exclusive Helicobacter pylori eradication therapy: experience from a large prospective series. Gut. 2004 Jan. 53(1):34-7. [Medline]. [Full Text]. Breckan RK, Paulssen EJ, Asfeldt AM, Mortensen L, Straume B, Florholmen J. The impact of body mass index and Helicobacter pylori infection on gastro-oesophageal reflux symptoms: a population-based study in Northern Norway. Scand J Gastroenterol. 2009. 44(9):1060-6. [Medline]. Sýkora J, Siala K, Varvarovská J, Pazdiora P, Pomahacová R, Huml M. Epidemiology of Helicobacter pylori infection in asymptomatic children: a prospective population-based study from the Czech Republic. Application of a monoclonal-based antigen-in-stool enzyme immunoassay. Helicobacter. 2009 Aug. 14(4):286-97. [Medline]. Ricuarte O, Gutierrez O, Cardona H, Kim JG, Graham DY, El-Zimaity HM. Atrophic gastritis in young children and adolescents. J Clin Pathol. 2005 Nov. 58(11):1189-93. [Medline]. [Full Text]. Santos IS, Boccio J, Davidsson L, Hernandez-Triana M, Huanca-Sardinas E, Janjetic M, et al. Helicobacter pylori is not associated with anaemia in Latin America: results from Argentina, Brazil, Bolivia, Cuba, Mexico and Venezuela. Public Health Nutr. 2009 Oct. 12(10):1862-70. [Medline]. Dube C, Nkosi TC, Clarke AM, Mkwetshana N, Green E, Ndip RN. Helicobacter pylori antigenemia in an asymptomatic population of Eastern Cape Province, South Africa: public health implications. Rev Environ Health. 2009 Jul-Sep. 24(3):249-55. [Medline]. Zhang DH, Zhou LY, Lin SR, Ding SG, Huang YH, Gu F, et al. Recent changes in the prevalence of Helicobacter pylori infection among children and adults in high- or low-incidence regions of gastric cancer in China. Chin Med J (Engl). 2009 Aug 5. 122(15):1759-63. [Medline]. Mazloom A, Rodriguez A, Ha CS, Medeiros LJ, Wogan C, Shihadeh F. Incidence of gastric involvement in patients with nongastrointestinal extranodal marginal zone lymphoma. Cancer. 2011 Jun 1. 117(11):2461-6. [Medline]. Blaser MJ. Hypothesis: the changing relationships of Helicobacter pylori and humans: implications for health and disease. J Infect Dis. 1999 Jun. 179(6):1523-30. [Medline]. Isaacson PG, Du MQ. MALT lymphoma: from morphology to molecules. Nat Rev Cancer. 2004 Aug. 4(8):644-53. [Medline]. Zucca E, Bertoni F, Roggero E, Bosshard G, Cazzaniga G, Pedrinis E, et al. Molecular analysis of the progression from Helicobacter pylori-associated chronic gastritis to mucosa-associated lymphoid-tissue lymphoma of the stomach. N Engl J Med. 1998 Mar 19. 338(12):804-10. [Medline]. Seydel J, Ullrich A, Bender R, Fischbach W, Blettner M. Helicobacter pylori and carcinogenesis of gastric B-cell lymphomas. Int J Cancer. 2003 May 1. 104(5):646-9. [Medline]. Hamoudi RA, Appert A, Ye H, Ruskone-Fourmestraux A, Streubel B, Chott A, et al. Differential expression of NF-kappaB target genes in MALT lymphoma with and without chromosome translocation: insights into molecular mechanism. Leukemia. 2010 Aug. 24(8):1487-97. [Medline]. Raderer M, Wöhrer S, Streubel B, Troch M, Turetschek K, Jäger U, et al. Assessment of disease dissemination in gastric compared with extragastric mucosa-associated lymphoid tissue lymphoma using extensive staging: a single-center experience. J Clin Oncol. 2006 Jul 1. 24(19):3136-41. [Medline]. Brandtzaeg P, Farstad IN, Haraldsen G. Regional specialization in the mucosal immune system: primed cells do not always home along the same track. Immunol Today. 1999 Jun. 20(6):267-77. [Medline]. Boot H. Diagnosis and staging in gastrointestinal lymphoma. Best Pract Res Clin Gastroenterol. 2010 Feb. 24(1):3-12. [Medline]. Capelle LG, de Vries AC, Looman CW, Casparie MK, Boot H, Meijer GA, et al. Gastric MALT lymphoma: epidemiology and high adenocarcinoma risk in a nation-wide study. Eur J Cancer. 2008 Nov. 44(16):2470-6. [Medline]. Wöhrer S, Troch M, Streubel B, Zwerina J, Skrabs C, Formanek M, et al. MALT lymphoma in patients with autoimmune diseases: a comparative analysis of characteristics and clinical course. Leukemia. 2007 Aug. 21(8):1812-8. [Medline]. Eck M, Greiner A, Schmausser B, Eck H, Kolve M, Fischbach W, et al. Evaluation of Helicobacter pylori in gastric MALT-type lymphoma: differences between histologic and serologic diagnosis. Mod Pathol. 1999 Dec. 12(12):1148-51. [Medline]. Ruskoné-Fourmestraux A, Lavergne A, Aegerter PH, Megraud F, Palazzo L, de Mascarel A. Predictive factors for regression of gastric MALT lymphoma after anti-Helicobacter pylori treatment. Gut. 2001 Mar. 48(3):297-303. [Medline]. Isaacson PG, Spencer J. Malignant lymphoma of mucosa-associated lymphoid tissue. Histopathology. 1987 May. 11(5):445-62. [Medline]. El-Zimaity HM, Wotherspoon A, de Jong D. Interobserver variation in the histopathological assessment of malt/malt lymphoma: towards a consensus. Blood Cells Mol Dis. 2005 Jan-Feb. 34(1):6-16. [Medline]. Brown PJ, Ashe SL, Leich E, Burek C, Barrans S, Fenton JA, et al. Potentially oncogenic B-cell activation-induced smaller isoforms of FOXP1 are highly expressed in the activated B cell-like subtype of DLBCL. Blood. 2008 Mar 1. 111(5):2816-24. [Medline]. Sagaert X, de Paepe P, Libbrecht L, Vanhentenrijk V, Verhoef G, Thomas J, et al. Forkhead box protein P1 expression in mucosa-associated lymphoid tissue lymphomas predicts poor prognosis and transformation to diffuse large B-cell lymphoma. J Clin Oncol. 2006 Jun 1. 24(16):2490-7. [Medline]. Musshoff K. [Clinical staging classification of non-Hodgkin's lymphomas (author's transl)]. Strahlentherapie. 1977 Apr. 153(4):218-21. [Medline]. Rohatiner A, d'Amore F, Coiffier B, Crowther D, Gospodarowicz M, Isaacson P, et al. Report on a workshop convened to discuss the pathological and staging classifications of gastrointestinal tract lymphoma. Ann Oncol. 1994 May. 5(5):397-400. [Medline]. Ruskoné-Fourmestraux A, Dragosics B, Morgner A, Wotherspoon A, De Jong D. Paris staging system for primary gastrointestinal lymphomas. Gut. 2003 Jun. 52(6):912-3. [Medline]. Radaszkiewicz T, Dragosics B, Bauer P. Gastrointestinal malignant lymphomas of the mucosa-associated lymphoid tissue: factors relevant to prognosis. Gastroenterology. 1992 May. 102(5):1628-38. [Medline]. Zucca E, Copie-Bergman C, Ricardi U, Thieblemont C, Raderer M, Ladetto M. Gastric marginal zone lymphoma of MALT type: ESMO Clinical Practice Guidelines for diagnosis, treatment and follow-up. Ann Oncol. 2013 Oct. 24 Suppl 6:vi144-8. [Medline]. Hwang HS, Yoon DH, Suh C, Park CS, Huh J. Intestinal diffuse large B-cell lymphoma: an evaluation of different staging systems. J Korean Med Sci. 2014 Jan. 29(1):53-60. [Medline]. Boveri E, Arcaini L, Merli M, Passamonti F, Rizzi S, Vanelli L, et al. Bone marrow histology in marginal zone B-cell lymphomas: correlation with clinical parameters and flow cytometry in 120 patients. Ann Oncol. 2009 Jan. 20(1):129-36. [Medline]. Wündisch T, Thiede C, Morgner A, Dempfle A, Günther A, Liu H, et al. Long-term follow-up of gastric MALT lymphoma after Helicobacter pylori eradication. J Clin Oncol. 2005 Nov 1. 23(31):8018-24. [Medline]. Iwaya Y, Kobayashi M, Momose M, Hiraoka N, Sakai Y, Akamatsu T, et al. High levels of FOXP3? regulatory T cells in gastric MALT lymphoma predict responsiveness to Helicobacter pylori eradication. Helicobacter. 2013 Oct. 18(5):356-62. [Medline]. Levy M, Copie-Bergman C, Traulle C, Lavergne-Slove A, Brousse N, Flejou JF, et al. Conservative treatment of primary gastric low-grade B-cell lymphoma of mucosa-associated lymphoid tissue: predictive factors of response and outcome. Am J Gastroenterol. 2002 Feb. 97(2):292-7. [Medline].